Nissan Leaf, no Liquid Cooling Still? Nissan is going to release a new battery chemistry for their Nissan Leafs. The car made headlines over a year ago when drivers in hot(ter) climates were seeing a larger battery degradation because of the higher average outside temperatures. But considering the other OEMs, was this a strategic step forward? The other OEMs have not faced similar problems, but then again, they use a liquid cooling system to keep their battery packs at a healthy temperature. So was implementing a new battery chemistry really cheaper, or a better way to go forward to improve the Nissan Leaf? Or was this something they were working on anyway and will we see a Nissan Leaf with a liquid cooled battery pack in the next version of the car? Some owners of the Nissan Leaf electric vehicle had found the driving range of their cars had dropped significantly. The story has escalated on numerous blogs lately; root causes are in my opinion in communication and the used technology. 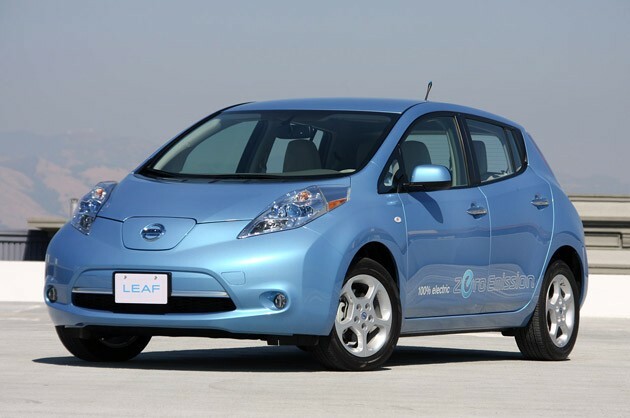 The range had dropped even more than Nissan itself claims would be normal for the Leaf. The advertised range of 160km was down to 90% or less for some. Having confronted Nissan with the matter, Nissan’s initial response was there is nothing wrong with the batteries; it is just bad instrumentation causing the problems. One consistent factor in all cases with decreased ranges seems to be that the Leafs in question have all experienced higher than average temperatures (with a few exceptions). The warmer climate in for example Arizona or Texas can put a bigger strain on the batteries than more moderate conditions would. After more and more Nissan Leaf drivers raised questions regarding their dropped battery capacity, Nissan made a statement on their warranty. A lot is covered by their warranty, such as the amount of power that can be drawn (in kW), but not the battery capacity (in kWh). It is a bit of a defensive response if you ask me. Personally I think the Nissan response to their customers is a bit odd; telling them it is normal, and then it is due to faulty instrumentation, and then telling their warranty does not cover capacity. It is not an example of the stellar customer service desks roaming the internet that we have come to like, quite the contrary. Nissan, please step up! Some time after these tests have hit the internet, Nissan has setup a Global Leaf Advisory Board, led by Chelsea Sexton. Nissan’s “hope is that they would hold up a mirror to us and help us be more open and approachable in our communications and advise us on our strategy.” Sexton previously served on a specialist advisory board for General Motors prior to its launch of the Chevrolet Volt, and is known and respected for her candor and knowledge of plug-in cars. Let’s hope this board will help customers feel heard by Nissan and that it will help Nissan to understand what customers want them to do. Communication problem solved? Other brands of electric vehicles have not made any splashes in the news like this. There are some isolated cases I could find, but if you are aware of more, please let me know. The main difference with the other EVs lies in the cooling method used. All the others used a liquid cooling system. The liquid is cleverly routed through the pack and absorbs the heat. The heat then gets released outside of the pack and the cooled down liquid is fed back into the pack. FWith the Nissan Leaf, there (used to be?) is an Air Cooled system in place. The benefit of an air cooled system is that is cheaper and easier to install. The downside is that the liquid system can absorb heat more efficiently, but the liquid also acts as a thermal buffer in colder/hotter conditions. I just hope that Nissan will either upgrade their battery cooling system, either with a better air cooling system, or just like the rest and hop on the liquid cooling system. I’d put my bets on the last option though. Pike's Peak International Hillclimb will feature a nice field of electric vehicles that are up for the challenge. Ranging from a modified iMiev to a Nissan Leaf, the latest additionis a converted BMW M3 from 1995 by conversion company EV West. It currently boasts 400 hp from its pure electric drive train, but is said to achieve a staggering 700 hp for the race. It will prove to be an interesting event, that's for sure. Pike's Peak International Hillclimb starts July 3rd this year, don't miss it! In my previous post I detailed on Range Anxiety, this post will detail on the other aspects that are related to Range Anxiey in an electric vehicle. The other part of the equation regarding range anxiety is the range people think they need to drive. When you take a look at the statistics, a lot of people here in the Netherlands for example, only drive about 40km per day. That is a trip to/from work, every day of the week. This is a range that can be perfectly handled by an electric vehicle, as it can do four times as much than this average range. Take into account that you probably will charge when you are either at home or at work and there really is no problem at all. However, here in the Netherlands a vast group of people uses the car for their holiday trips, once or two times per year there is a really long trip they do with their vehicle (over 1000km). Because the electric vehicle can not do such a trip in one go (neither can the driver by the way, people tend to take a coffee break every two hours), they claim that the electric vehicle is not for them. In this case they prefer to have the car that can do all of their trips they will ever make and not take a car that will do what they need most, at the best. Compare this to people who take a vacation and go by plane. For that they also ‘rent’ a chair in an airplane instead of buying the airplane. In this case it has become fairly obvious that buying a plane is not worth your money. Similar holds for buying a power drill, if you only have to put up a picture on the wall about once every year, you will probably not go for the most expensive power drill around that could drill the equivalent of the Canal tunnel from France to the United Kingdom. It is a matter of raising awareness to show people that an electric vehicle is ideal for the majority of their trips and a much more efficient means of transport. For those few trips we currently ‘abuse’ the internal combustion engine vehicle to do so, there will be alternatives. Be it a Hydrogen Fuel Cell Hybrid vehicle, trains of airplanes. It is also worth noting that the current range of the vehicles will increase, as will the speed at which we can charge up our vehicle. If both areas provide enough improvement, range anxiety will also decrease. There have been a number of attempts to see what is the maximum range you can travel with an electric vehicle. Sometimes they focus on the maximum distance on a single charge, also called ‘Hypermiling’. The others simply charge up after the battery is depleted and push on again. One such an attempt was by U.S. Army veteran Jerry Asher, he managed to drive 772 km (480 miles) in a period of 7 days. A distance that is traveled by a conventional car in around 10 hours. Not exactly a speedy trip, but that was not the goal of Jerry Asher. For the people of Epyon, providers of fast charging solutions, speed is a selling point. They wanted to know how far they could travel using a Nissan Leaf, in 24 hours, using fast chargers to recharge the Leaf. They managed to rake in a whopping 1254 km (779 miles), also be sure to check out their video detailing this fast charged trip!